This massive chandelier hangs with a 36” diameter and would function as a wonderful feature piece in any large space. Featuring 288 shining crystals on 12 chrome plated steel rows and 54 light bulbs on 6 rows, this chandelier is incredibly illuminating. 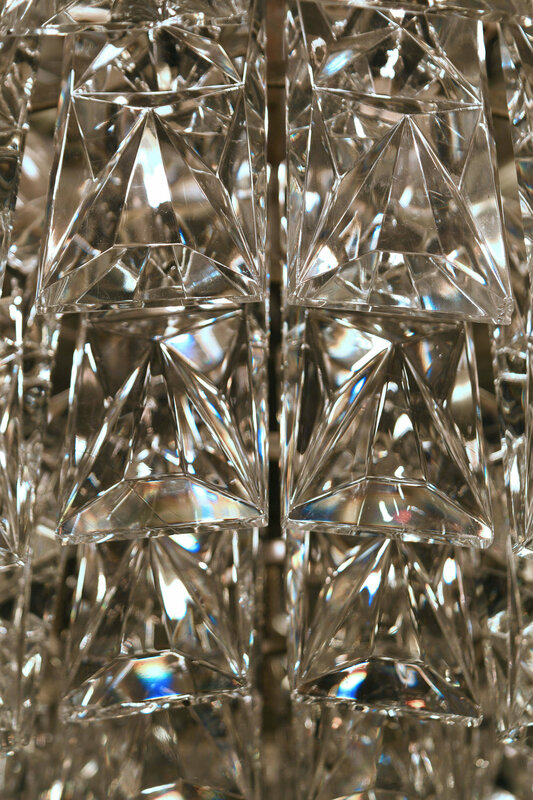 The refracted light from the abundant crystals creates a dazzling and elegant atmosphere! It was once the main chandelier at the Brookdale Theater in Brooklyn Center, Minnesota and was installed when the theater opened in 1970. This head-turning chandelier deserves to dazzle audiences once again! We find that early antique lighting was designed as objects of art and we treat each fixture with careful attention to preserve original beauty. Our fixtures are cleaned, rewired & are ready to hang, following UL standards. We can work with you on code requirements. Be sure to include the Product ID AA#48118 when making your offer.